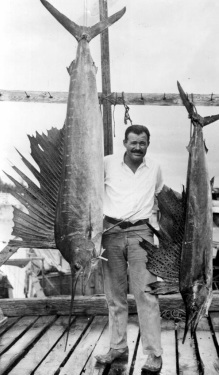 Ernest Hemingway knew how to have a good time, and after visiting Key West for the first time with his wife Pauline, America's favorite good-times author was hooked. "It’s the best place I’ve ever been anytime, anywhere, flowers, tamarind trees, guava trees, coconut palms...Got tight last night on absinthe and did knife tricks," he enthused. The couple rented an apartment and a house for a couple years. Pauline's wealthy Uncle Gus helped them buy a large house at 907 Whitehead Street. The Spanish colonial house was built in the 1850s and now operates as a museum, one of the island's most popular tourist destinations. Hemingway used the second floor as a writing studio and in the house produced the novel To Have and Have Not, the non-fiction work Green Hills of Africa and the short story "The Snows of Kilimanjaro." When he wasn't writing, he frequented the bar Sloppy Joes, entertained his writer friends, fished and visited the Dry Tortugas. He met his third wife, Martha Gelhorn, in Key West, in 1936 and moved to Cuba in 1939. His son Patrick has asserted that it was in Cuba and not Key West that Hemingway allowed dozens of cats to live on his property. But the Key West house is populated with six- and seven-toed cats that organizers say are descendants of the author's original Key West pets. A 1937 letter from Pauline mentions two cats, Snow White and Esther. Long after leaving Key West, Hemingway committed suicide at his home in Ketchum, Idaho on July 2, 1961. Hemingway retained title to the Key West house until he died. It was placed on the National Registry of Historic Places in 1968.